Our ultimate goal is to bootstrap a long-lasting initiative between various sectors (i.e., industry, academia, journalism, civil society) for countering digital misinformation. We will discuss the possibility to create community spaces for follow-up discussion and further collaborative activity; a special focus will be placed on the identification of viable funding instruments for future collaborative activities, the scope of which will likely include research, education, and policymaking. How to define and detect misinformation? How to best study the cognitive, social, and technological biases that make us vulnerable to misinformation? What countermeasures are most feasible and effective and who can best deliver them? The results can be found in the workshop report. 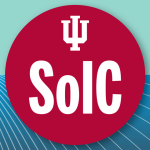 We acknowledge generous support from the Department of Informatics, Indiana University School of Informatics and Computing, and from the IU Network Science Institute.